Hello, all! I had a little day in paradise yesterday. The sun was shining and I decided I needed a mental health day so I took my daughter to the beach for a few hours. It was glorious. As we were driving to the beach I took some joy in our surroundings and how beautiful my little part of the world can be. I also find it amazing how a hurricane ravaged area can recover so quickly. Nature is amazing. 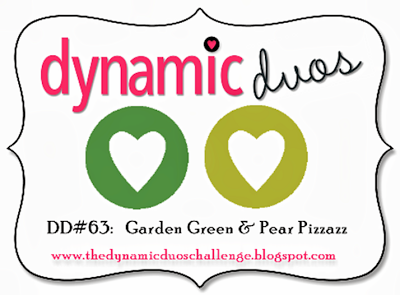 Perhaps I was inspired by my surroundings, but I was also inspired by the color challenge at Dynamic Duos. Though I must admit, at first glance I wasn't feeling it. 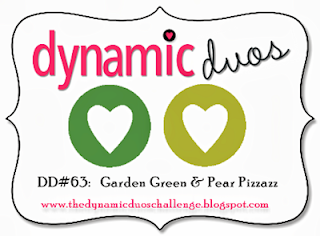 I totally love all shades of green, but Garden Green is my least used of all greens and I questioned the combo of Pear Pizzazz. As it turns out, they are perfect colors for a tropical scheme. This is one of my "retired product field day" cards! The Paradise Stamp Set is long retired, but I acquired it from one of my fellow demonstrators, who in turn swapped me for some some of my retired products. Life is good! 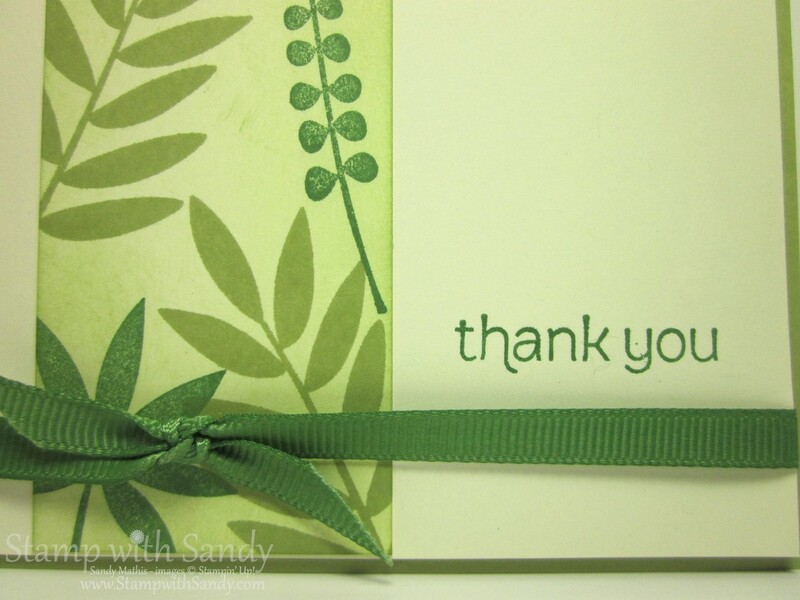 Also retired (or vintage, as my friend would say) are the Garden Green Grosgrain Ribbon and Made for You stamp set. Lovely pattern you've created with those retired stamps Sandy. Very pretty! And...a few hours at the beach sounds wonderful. What better place to find stamping inspiration??? This is one of those sets that I wanted but waited too long and it retired,oh well.. 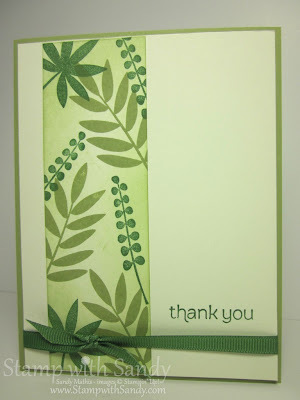 I love your card it's very tropical and your right those greens look lovely together! What a beautiful impact this strip of hand-made DSP makes on this card. Love it!